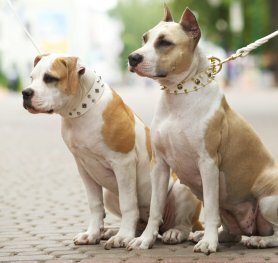 The history of Amstaff breed has more than 300 years. Old English bulldogs and terriers are considered to be their ancestors. They were courageous, fearless dogs with strong and compact body, well-developed muscles and huge jaws. They were bred specially for hounding, (attacking a bull that was tied to a peg by sinking the teeth into bull's nose). There are some old engravings with the images of fighting bulldogs which have very similar body structure to Amstaffs'. American Staffordshire Terrier breed is a result of crossbreeding of bulldogs and terriers; these dogs obtained strength, courage and rigidity of bulldogs and aggressiveness; quickness and pushiness of terriers. Also Amstaffs inherited power and massiveness of bulldogs, and at the same time this breed became more agile and mobile. This canine was initially called "Bull-and-terrier". American Staffordshire Terrier should give the impression of strength due to his size; a dog will great constitution, muscular, but at the same time agile, graceful, keenly alive to his surroundings. Amstaff should be stocky, not long-legged or greyhound like. This breed is famous for its courage. Height at the withers - about 18-19 inches (46-48 cm) for males and 17-18 inches (44-46 cm) for females. Weight – around 50 lbs (23-25 kg). Short, tight, stiff to the touch and glossy. Any color is permissible – solid monochrome, parti-color, brindle. More than 80% pure white as well as black and tan - are undesirable. Medium length, deep with a broad skull and distinct stop; muzzle is of medium length, not lowered. Slightly round nose bridge. Nose is always black. Set high, cropped or uncropped (the latter preferred). Uncropped ears should be short and held rose or half prick. Full drop ears are penalized. Dark, round, deep-set, set far apart. Eyelids should not be pink. Massive, slightly arched, tapering from the shoulders to back of skull, of medium length, no dewlap. Well defined. Strong jaws provide powerful grip. The lips are close and even; no flews. Broad and deep; well sprung ribs; close together, deep in rear. Short in comparison to the whole dog's size. Low set, tapering to an end. Not curled or carried over his back. Not docked. Forequarters: straight with strong large round bones. The pasterns are upright. Hindquarters: well-muscled. The hocks are moderately short, turning neither in nor out. Feet are of medium size, with well arched and compact. Has springy movements. Amstaff is cheerful, but not fussy. He is not inclined to winning, which is very annoying. He loves to play anytime and anywhere with anybody, whether this is his owner, a child or a pet. Amstaff possesses an innate ability to feel dangerous situations. He is one of the best guardians. Amstaff likes to stay close to his owner, and would not come out of the room, if his owner is still in it. He can be unleashed without the fear that he will escape. 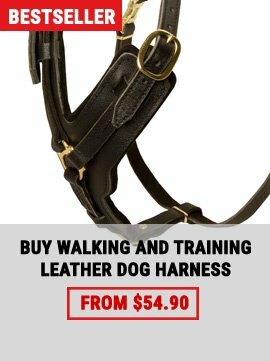 Do you need top quality dog training tools for your Amstaff? 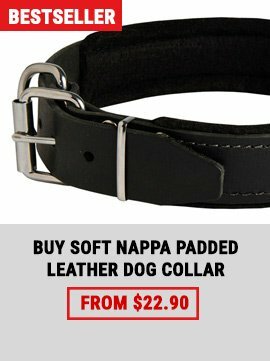 Or you are just looking for walking accessories for your beloved pet? Then you have found the right place! 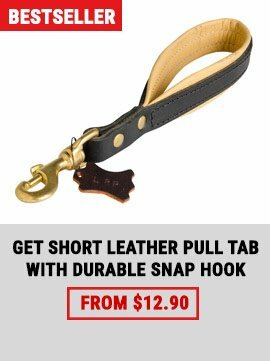 You will be stunned by the variety of dog gear available in our dog store. Check our pulling nylon harness, police service nylon lead, fire hose bite tugs, innovative anti-pulling ultrasonic device, lightweight travelling muzzle and many other Dog Training Tools.